A TOSLINK optical fiber cable with a clear jacket. These cables are used mainly for digital audio connections between devices. An optical fiber cable, also known as a fiber optic cable, is an assembly similar to an electrical cable, but containing one or more optical fibers that are used to carry light. The optical fiber elements are typically individually coated with plastic layers and contained in a protective tube suitable for the environment where the cable will be deployed. Different types of cable are used for different applications, for example long distance telecommunication, or providing a high-speed data connection between different parts of a building. Optical fiber consists of a core and a cladding layer, selected for total internal reflection due to the difference in the refractive index between the two. In practical fibers, the cladding is usually coated with a layer of acrylate polymer or polyimide. This coating protects the fiber from damage but does not contribute to its optical waveguide properties. Individual coated fibers (or fibers formed into ribbons or bundles) then have a tough resin buffer layer or core tube(s) extruded around them to form the cable core. Several layers of protective sheathing, depending on the application, are added to form the cable. Rigid fiber assemblies sometimes put light-absorbing ("dark") glass between the fibers, to prevent light that leaks out of one fiber from entering another. This reduces cross-talk between the fibers, or reduces flare in fiber bundle imaging applications. Investigating a fault in a fiber cable junction box. The individual fiber cable strands within the junction box are visible. For use in more strenuous environments, a much more robust cable construction is required. In loose-tube construction the fiber is laid helically into semi-rigid tubes, allowing the cable to stretch without stretching the fiber itself. This protects the fiber from tension during laying and due to temperature changes. Loose-tube fiber may be "dry block" or gel-filled. Dry block offers less protection to the fibers than gel-filled, but costs considerably less. Instead of a loose tube, the fiber may be embedded in a heavy polymer jacket, commonly called "tight buffer" construction. Tight buffer cables are offered for a variety of applications, but the two most common are "Breakout" and "Distribution". Breakout cables normally contain a ripcord, two non-conductive dielectric strengthening members (normally a glass rod epoxy), an aramid yarn, and 3 mm buffer tubing with an additional layer of Kevlar surrounding each fiber. The ripcord is a parallel cord of strong yarn that is situated under the jacket(s) of the cable for jacket removal. Distribution cables have an overall Kevlar wrapping, a ripcord, and a 900 micrometer buffer coating surrounding each fiber. These fiber units are commonly bundled with additional steel strength members, again with a helical twist to allow for stretching. A critical concern in outdoor cabling is to protect the fiber from contamination by water. This is accomplished by use of solid barriers such as copper tubes, and water-repellent jelly or water-absorbing powder surrounding the fiber. Finally, the cable may be armored to protect it from environmental hazards, such as construction work or gnawing animals. Undersea cables are more heavily armored in their near-shore portions to protect them from boat anchors, fishing gear, and even sharks, which may be attracted to the electrical power that is carried to power amplifiers or repeaters in the cable. Modern cables come in a wide variety of sheathings and armor, designed for applications such as direct burial in trenches, dual use as power lines, installation in conduit, lashing to aerial telephone poles, submarine installation, and insertion in paved streets. In September 2012, NTT Japan demonstrated a single fiber cable that was able to transfer 1 petabit per second (1015bits/s) over a distance of 50 kilometers. Modern fiber cables can contain up to a thousand fibers in a single cable, with potential bandwidth in the terabytes per second. In some cases, only a small fraction of the fibers in a cable may be actually "lit". Companies can lease or sell the unused fiber to other providers who are looking for service in or through an area. 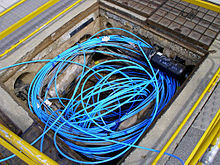 Companies may "overbuild" their networks for the specific purpose of having a large network of dark fiber for sale, reducing the overall need for trenching and municipal permitting. They may also deliberately under-invest to prevent their rivals from profiting from their investment. The highest strand-count singlemode fiber cable commonly manufactured is the 864-count, consisting of 36 ribbons each containing 24 strands of fiber. Optical fibers are very strong, but the strength is drastically reduced by unavoidable microscopic surface flaws inherent in the manufacturing process. The initial fiber strength, as well as its change with time, must be considered relative to the stress imposed on the fiber during handling, cabling, and installation for a given set of environmental conditions. There are three basic scenarios that can lead to strength degradation and failure by inducing flaw growth: dynamic fatigue, static fatigues, and zero-stress aging. Telcordia GR-20, Generic Requirements for Optical Fiber and Optical Fiber Cable, contains reliability and quality criteria to protect optical fiber in all operating conditions. The criteria concentrate on conditions in an outside plant (OSP) environment. For the indoor plant, similar criteria are in Telcordia GR-409, Generic Requirements for Indoor Fiber Optic Cable. The jacket material is application-specific. The material determines the mechanical robustness, chemical and UV radiation resistance, and so on. Some common jacket materials are LSZH, polyvinyl chloride, polyethylene, polyurethane, polybutylene terephthalate, and polyamide. There are two main types of material used for optical fibers: glass and plastic. They offer widely different characteristics and find uses in very different applications. Generally, plastic fiber is used for very short range and consumer applications, glass fiber is used for short/medium range (multi-mode) and long range (single-mode) telecommunications. Blue Physical Contact (PC), 0° mostly used for single mode fibers; some manufacturers use this for polarization-maintaining optical fiber. Red High optical power. Sometimes used to connect external pump lasers or Raman pumps. Remark: It is also possible that a small part of a connector is additionally color-coded, e.g. the lever of an E-2000 connector or a frame of an adapter. This additional colour coding indicates the correct port for a patchcord, if many patchcords are installed at one point. Individual fibers in a multi-fiber cable are often distinguished from one another by color-coded jackets or buffers on each fiber. The identification scheme used by Corning Cable Systems is based on EIA/TIA-598, "Optical Fiber Cable Color Coding." EIA/TIA-598 defines identification schemes for fibers, buffered fibers, fiber units, and groups of fiber units within outside plant and premises optical fiber cables. This standard allows for fiber units to be identified by means of a printed legend. This method can be used for identification of fiber ribbons and fiber subunits. The legend will contain a corresponding printed numerical position number or color for use in identification. The colour code used above resembles PE copper cables used in standard telephone wiring. Each element is in a tube within the cable (not a blown fibre tube) The cable elements start with the red tube and are counted around the cable to the green tube. Active elements are in white tubes and yellow fillers or dummies are laid in the cable to fill it out depending on how many fibres and units exists – can be up to 276 fibres or 23 elements for external cable and 144 fibres or 12 elements for internal. The cable has a central strength member normally made from fiberglass or plastic. There is also a copper conductor in external cables. Optical cables transfer data at the speed of light in glass. This is the speed of light in vacuum divided by the refractive index of the glass used, typically around 180,000 to 200,000 km/s, resulting in 5.0 to 5.5 microseconds of latency per km. Thus the round-trip delay time for 1000 km is around 11 milliseconds. Typical modern multimode graded-index fibers have 3 dB/km of attenuation loss (50% loss per km) at a wavelength of 850 nm, and 1 dB/km at 1300 nm. Singlemode 9/125 loses 0.4 dB/km at 1310 nm and 0.25 dB/km at 1550 nm. Very high quality singlemode fiber intended for long distance applications is specified at a loss of 0.19 dB/km at 1550 nm. POF (plastic optical fiber) loses much more: 1 dB/m at 650 nm. Plastic optical fiber is large core (about 1 mm) fiber suitable only for short, low speed networks such as within cars. Each connection made adds about 0.6 dB of average loss, and each joint (splice) adds about 0.1 dB. Depending on the transmitter power and the sensitivity of the receiver, if the total loss is too large the link will not function reliably. Invisible infrared light is used in commercial glass fiber communications because it has lower attenuation in such materials than visible light. However, the glass fibers will transmit visible light somewhat, which is convenient for simple testing of the fibers without requiring expensive equipment. Splices can be inspected visually, and adjusted for minimal light leakage at the joint, which maximizes light transmission between the ends of the fibers being joined. The charts at "Understanding wavelengths In fiber optics" and "Optical power loss (attenuation) in fiber" illustrate the relationship of visible light to the infrared frequencies used, and show the absorption water bands between 850, 1300 and 1550 nm. The infrared light used in telecommunications cannot be seen, so there is a potential laser safety hazard to technicians. The eye's natural defense against sudden exposure to bright light is the blink reflex, which is not triggered by infrared sources. In some cases the power levels are high enough to damage eyes, particularly when lenses or microscopes are used to inspect fibers that are emitting invisible infrared light. Inspection microscopes with optical safety filters are available to guard against this. More recently indirect viewing aids are used, which can comprise a camera mounted within a handheld device, which has an opening for the connectorized fiber and a USB output for connection to a display device such as a laptop. This makes the activity of looking for damage or dirt on the connector face much safer. Small glass fragments can also be a problem if they get under someone's skin, so care is needed to ensure that fragments produced when cleaving fiber are properly collected and disposed of appropriately. There are hybrid optical and electrical cables that are used in wireless outdoor Fiber To The Antenna (FTTA) applications. In these cables, the optical fibers carry information, and the electrical conductors are used to transmit power. These cables can be placed in several environments to serve antennas mounted on poles, towers, and other structures. According to Telcordia GR-3173, Generic Requirements for Hybrid Optical and Electrical Cables for Use in Wireless Outdoor Fiber To The Antenna (FTTA) Applications, these hybrid cables have optical fibers, twisted pair/quad elements, coaxial cables or current-carrying electrical conductors under a common outer jacket. The power conductors used in these hybrid cables are for directly powering an antenna or for powering tower-mounted electronics exclusively serving an antenna. They have a nominal voltage normally less than 60 VDC or 108/120 VAC. Other voltages may be present depending on the application and the relevant National Electrical Code (NEC). These types of hybrid cables may also be useful in other environments such as Distributed Antenna System (DAS) plants where they will serve antennas in indoor, outdoor, and roof-top locations. Considerations such as fire resistance, Nationally Recognized Testing Laboratory (NRTL) Listings, placement in vertical shafts, and other performance-related issues need to be fully addressed for these environments. Since the voltage levels and power levels used within these hybrid cables vary, electrical safety codes consider the hybrid cable to be a power cable, which needs to comply with rules on clearance, separation, etc. Innerducts are installed in existing underground conduit systems to provide clean, continuous, low-friction paths for placing optical cables that have relatively low pulling tension limits. They provide a means for subdividing conventional conduit that was originally designed for single, large-diameter metallic conductor cables into multiple channels for smaller optical cables. Innerducts are typically small-diameter, semi-flexible subducts. According to Telcordia GR-356, there are three basic types of innerduct: smoothwall, corrugated, and ribbed. These various designs are based on the profile of the inside and outside diameters of the innerduct. The need for a specific characteristic or combination of characteristics, such as pulling strength, flexibility, or the lowest coefficient of friction, dictates the type of innerduct required. Beyond the basic profiles or contours (smoothwall, corrugated, or ribbed), innerduct is also available in an increasing variety of multiduct designs. Multiduct may be either a composite unit consisting of up to four or six individual innerducts that are held together by some mechanical means, or a single extruded product having multiple channels through which to pull several cables. In either case, the multiduct is coilable, and can be pulled into existing conduit in a manner similar to that of conventional innerduct. Innerducts are primarily installed in underground conduit systems that provide connecting paths between manhole locations. In addition to placement in conduit, innerduct can be directly buried, or aerially installed by lashing the innerduct to a steel suspension strand. Blown into the innerduct using a high air volume cable blowing apparatus. ^ Posinna, Mariddetta (Apr 1, 2014). "different types of fiber optic cables". HFCL. Archived from the original on 2016-04-20. Retrieved 2016-04-11. ^ "Light collection and propagation". National Instruments' Developer Zone. Archived from the original on 2015-12-22. Retrieved 2015-10-08. Hecht, Jeff (2002). Understanding Fiber Optics (4th ed.). Prentice Hall. ISBN 0-13-027828-9. ^ "Definition: rip cord". Its.bldrdoc.gov. Archived from the original on 2012-01-20. Retrieved 2011-12-10. ^ Chirgwin, Richard (Sep 23, 2012). "NTT demos petabit transmission on single fibre". The Register. Archived from the original on 2014-02-21. Retrieved 2014-02-16. ^ "OFS 864-strand singlemode fiber cable datasheet" (PDF). Archived (PDF) from the original on 2016-04-25. ^ "GR-20, Generic Requirements for Optical Fiber and Optical Fiber Cable". Telcordia. Archived from the original on 2016-01-20. ^ "GR-409, Generic Requirements for Indoor Fiber Optic Cable". Telcordia. Archived from the original on 2011-09-30. ^ "Single-Mode VS. Multimode Fiber Cable". Archived from the original on 2013-09-29. Retrieved 2013-09-24. ^ Crawford, Dwayne (Sep 11, 2013). "Who is Erika Violet and what is she doing in my data center?". Tech Topics. Belden. Archived from the original on 2014-02-22. Retrieved Feb 12, 2014. ^ a b c Leroy Davis (2007-02-21). "Fiber wire color coding". Archived from the original on 2007-12-12. Retrieved 2007-12-01. ^ Latency and Jitter Archived 2016-04-27 at the Wayback Machine Retrieved 2016-04-09. ^ "Corning LEAF G.655 type singlemode fiber datasheet" (PDF). Archived (PDF) from the original on 2015-12-03. ^ Optical Fiber Archived 2010-08-12 at the Wayback Machine (tutorial at lanshack.com) Retrieved 2010-08-20. ^ Calculating the Maximum Attenuation for Optical Fiber Links Archived 2011-06-09 at the Wayback Machine. Cisco document 27042. Retrieved 2010-08-20. ^ Hayes, Jim. "Understanding Wavelengths In Fiber Optics". The Fiber Optic Association. Archived from the original on 2013-12-02. Retrieved 2014-01-13. ^ "Optical power loss (attenuation) in fiber". Ad-net.com.tw. Archived from the original on 2013-12-02. Retrieved 2014-01-13. ^ GR-3173, Generic Requirements for Hybrid Optical and Electrical Cables for Use in Wireless Outdoor Fiber To The Antenna (FTTA) Applications Archived 2016-01-20 at the Wayback Machine. Telcordia. ^ GR-356, Generic Requirements for Optical Cable Innerduct, Associated Conduit, and Accessories Archived 2016-01-20 at the Wayback Machine. Telcordia. Wikimedia Commons has media related to Optical fiber cables.